TWO Masterminds to choose from! Marion and Carterville Mastermind Groups signups open now! The Marion Chamber of Commerce Foundation will include the thermometer in the Marion Chamber of Commerce newsletter. Please contact the Marion Park District for more information about the Heartland Regional Medical Center Inclusive Playground. Keeping true to our mission statement, the vision of the Marion Park District is to create a universally designed play environment, an inclusive playground, at Ray Fosse Park that increases the opportunities for children of diverse abilities. With the community’s help, we wish to build a playground area that creates a safe and fun environment for children and adults of ALL abilities. This will be a play and fitness space that becomes a destination for the entire Southern Illinois area to enjoy. This project will include a multi-generational fitness area so both children and adults can lead a more active and healthy lifestyle, spend quality time together and foster new friendships and memories. The project cost will be approximately $375,000. The Marion Park District has committed $150,000 of Capital Improvement funds to the project. 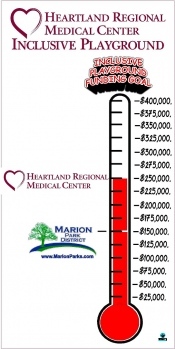 Heartland Regional Medical Center has promised $100,000 and has become our ‘named’ partner in this endeavor. Marion Noontime Rotary Club has committed $10,000 to make this vision become a reality. We are beginning to receive smaller private and corporate donations, as well. The Marion Park District is comprised of seven (7) parks located within the City of Marion. In total our parks are comprised of approximately 115 acres. We feature ten (10) ball fields, twelve (12) soccer fields, four (4) tennis courts, three (3) basketball courts, one (1) skate board park, one (1) roller hockey court, one (1) 18 hole disc golf course and a 220,000-gallon Aquatic Center. All of the parks feature playground equipment as well. In addition, our parks feature two (2) Boy Scout/ Girl Scout cabins, which are used for scouting activities and rentals to the public for a variety of events; we also have fourteen (14) shelters within our park system. Beginning in the Fall of 2016, the Marion Park District began undertaking an aggressive Capital Improvement initiative. To date we have updated park services equipment, added fall protection to our playgrounds, renovated 6 infield playing surfaces at Ray Fosse Park, developed a professionally designed 18-hole disc golf course, Pharaoh’s Way Disc Golf at Pyramid Park and replaced 3 large slides in various parks. In addition, we will be opening THE Bark Park in January of 2018. It is in Russell Street Park and features over 29,000 square feet of interactive play. This modern dog park will feature large and small dog play areas and will be a ‘membership’ park to provide security for both patrons and canines. Additionally, with the generosity of a private foundation, we will be renovating the tennis courts in Russell Street Park in the Spring of 2018. Other visions being considered by the Marion Park District Board of Commissioners are adding beach volleyball and bocce courts at Ray Fosse Park. Any tax –deductible donations by individuals or businesses are welcome to help in our goal to build the “Inclusive” playground. Any requests or questions need to be directed to the Marion Park District at (618) 993-3940. For more information about the inclusive playground or to make a donation, click here. Please join with us and together, we can continue to create a Parks System that EVERYONE can enjoy. Thank you for your support to the Marion Park District! Shop Southern Illinois program underway! The Marion Chamber of Commerce’s 97th annual Awards Banquet & Auction will be held on Friday, January 19, 2018, and will include a Wine and Spirt Pull fundraiser. During the Social Hour, guests are encouraged to buy a cork for $15 or two for $25 which will have a corresponding number to one of the bottles of wine or spirits on hand. Your business participation by donating a wine or spirit valued at $20 or more to be used in the Wine & Spirit Pull would be very much appreciated. All donations will be accepted through Thursday, January 4. To donate a bottle or bottles, click here to download the donation form. You may also call the Marion Chamber at 997.6311 or email director@marionillinois.com to make a donation. We are expecting around 400 people in the community to be attending the annual dinner seeing your business’ name associated with the item you donated. All donors will be listed in a story on the Chamber’s Web site with links to each donor’s Web site. There will be an email sent out before the dinner letting people know about the items in the 2018 Annual Dinner Wine & Spirit Pull. Donors who have submitted their items by January 4 will be included in the 97th Annual Marion Chamber of Commerce Awards Banquet & Auction program. We would be more than willing to personally pick up any donation or they may be dropped off at the Marion Chamber office. On behalf of the Marion Chamber of Commerce Annual Dinner Committee, we graciously accept your donation. Thank you for your support in making this another successful event! Please download and complete this form or fill out this online form about anyone who has contributed to the Marion Chamber of Commerce and/or the Greater Marion area who has passed away in 2017. 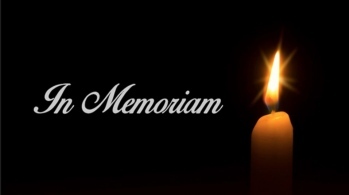 You may also call the Marion Chamber at 997.6311 or email director@marionillinois.com to submit someone who has passed for the In Memoriam. Submissions made prior to January 4, 2018, will be included in the In Memoriam tribute played during the 97th annual Marion Chamber of Commerce Auction & Awards Banquet on January 19 at the Pavilion. The Marion Chamber of Commerce’s 97th annual Awards Banquet & Auction will be held on Friday, January 19, 2018, and is the chief annual fundraiser for the Chamber. A fabulous evening is planned, and we hope you will join us! We expect more than 400 guests to attend, all leaders in our community. Please complete this online form or this downloadable form to make a donation for the banquet's Silent Auction. You may also call the Marion Chamber at 997.6311 or email director@marionillinois.com to make a donation. We also hope you will consider making a donation for the Banquet’s Silent Auction. The auction is a fun way to raise funds for the Marion Chamber of Commerce Foundation. By donating an item, gift certificate, service or monies, you can directly support the Chamber Foundation’s unique programs, which include scholarships for Marion-area graduates, the Marion High School Graduation Spree event, and other Marion Chamber of Commerce community-oriented programs. The Marion Chamber of Commerce works with business and professional people to build a healthy economy and improve the quality of life in the community. The Marion Chamber of Commerce Foundation, a 501(c)3 public charity, ensures the continuing advancement and mission of the Marion Chamber of Commerce. Our goal is to raise more than $5,000 from the Silent Auction. There are several benefits that you will see when you make a donation to the silent auction. There will be an email sent out before the dinner letting people know about the items to be auctioned. Your donation will be tax-deductible. 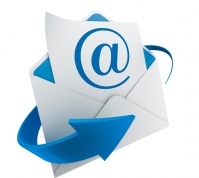 Following the Annual Dinner event, please contact the Chamber office to receive your donor acknowledgement letter. We are excited about your support of our new and improved Silent Auction this year at the 97th Annual Marion Chamber of Commerce Awards Banquet & Auction. All donations must be received at the Chamber by January 4, 2018, so we can adequately market your donation to the members. If you are unable to deliver your donation, please contact Dalus at the Chamber office and she will coordinate one of the members of our Committee to pick up your donation. If you have any questions, please do not hesitate to contact the Chamber. Once again, thank you for making your donation and we look forward to seeing you at the Awards Banquet on January 19, 2018. Grow yourself and make an impact on others! Mastermind Group signups beginning now for Marion and Carterville groups! The Marion Chamber of Commerce and the Carterville Chamber of Commerce have teamed up to host the first 2018 Mastermind Group on Fridays from 8:15 - 9:30 a.m., beginning January 12 and ending March 9 (9 weeks), at Irons in the Fire Event Center (above Crown Brew Coffee Co.) in downtown Carterville. This group is limited to the first 15 enrollments. The enrollment fee of $125 for Marion & Carterville Chamber members ($135 for non-Chamber) fee includes a book and is due before January 8. Register by clicking here. All registrations for Mastermind Groups are now handled by Russell Williams. Click here for the Carterville Mastermind Group flier. The Marion Chamber of Commerce will host the first 2018 Mastermind Group on Mondays from noon to 1:15 pm January 8 - March 12 (8 weeks with no meetings on MLK Jr. Day and Presidents' Day) at Heartland Regional Medical Center Classroom 1 (downstairs) except for February 26 when the group will meet in Classroom 2. This group is limited to the first 15 enrollments. The enrollment fee of $125 for Marion Chamber members ($135 for non-Chamber) fee includes a book and is due before January 8. Lunch and drinks provided complimentary of Heartland Regional Medical Center. Contact Russell Williams at 618-694-6586 or russell.williams@brehm.org to secure a seat or for more information. Register by clicking here. All registrations for Mastermind Groups are now handled by Russell Williams. Click here for the Marion Mastermind Group flier. “Change your habits change your life” is a popular saying but which habits lead to your sustained long-term success? This Mastermind Group will use Brad Lomenick’s book “H3 Leadership” to focus on developing the right daily habits and routines that build success for us as individuals and leaders of others. Join a group of like-minded, forward-focusing individuals, working towards the common goals of growing ourselves, reaching our potential, and raising the bar on our leadership! Experience the incredible energy that participants bring to this facilitated group setting. Masterminds can be an extremely powerful tool to take your thinking and actions (and therefore results) to the next level! Dive deep into leadership topics with supportive like-minded leaders and learners. Mastermind Groups offer a unique opportunity to learn from others’ perspectives and experiences; and safely share your individual challenges and opportunities. The facilitator is Russell Williams, Certified Leadership and Personal Growth Coach, Speaker, and Teacher. Leadership Marion is a development program for CEOs, Entrepreneurs, Managers, and All Potential Leaders coordinated by the Marion Chamber of Commerce Membership Committee. 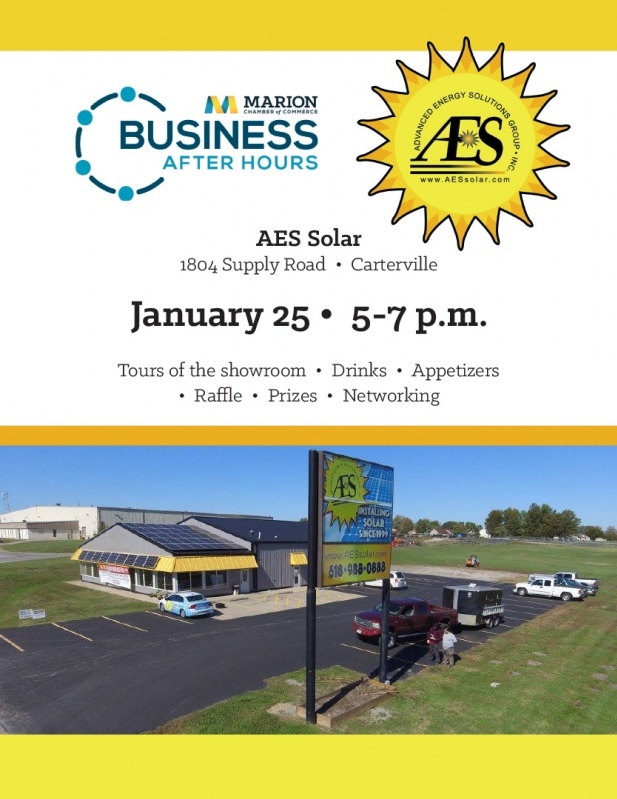 A Business After Hours for AES Solar, 1804 Supply Road in Carterville, will be held on January 25 from 5 to 7 p.m. with tours of the showroom, drinks, appetizers, raffle, prizes and networking.